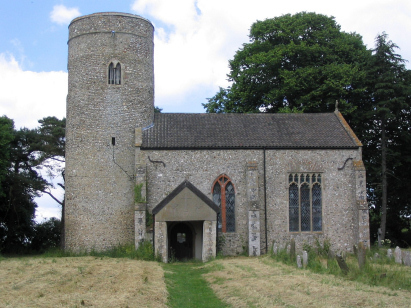 The parish of Runhall lies in eastern central Norfolk roughly midway between the market towns of East Dereham and Wymondham and west of the city of Norwich by about 10 miles. There is no distinct village to Runhall it is merely a scatter of farms and cottages on land to the north of the headwaters of the River Yare. The parish is sited to the east of the B1135 road which links East Dereham to Wymondham and is crossed by narrow lanes running east/west and north/south. This is prime arable land with land rising steadily to the north of the Yare in a broad plain about 50 metres above sea level, the roads are narrow and the fields are wide and the sky dominates everything. All Saints church is sited adjacent to the east/west running lane which leads through to Barnham Broom. 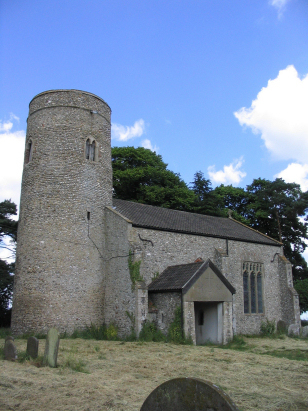 The church is a classic Norfolk "round tower" church indicating its early origins. Much of the church is Norman especially the tower, although the top is later. The main body of the church is a mixture of dates from the Norman through the 13th century nave to many windows which are of the Perpendicular period. As is usual the Victorians made their usual restoration without suppressing the architectural interest. The church sits in a grassy graveyard which is left to nature for most of the year, it was newly mown when I visited leaving the hay to give a curious pattern. A single standard 800-entry register covers the period of the transcript and indeed continues through to the end of the 20th century. This register is filmed on Microfilm MF902 in the collection of the Norfolk Record Office and from which this transcript was prepared. The film, whilst not a recent one, is of an acceptable quality with clear images, the handwriting, however, must carry a caveat as it is scruffy in places. Hopefully an accurate transcript has been made although the is the possibility of misreads due to this issue.